Author Leslie Heywood talks about her memoir, Pretty Good for Girl, which will be the subject of the Aug. 19 Pacers Summer Runner Book Club meeting. We start off the show talking about kids and presidents. At (4:54) none of us participated in April Fools and episode 149 indicates that we are almost three years into this podcast thing. At (7:42) the social media class is back in session as Farley amazes us with a lesson on Facebook birthdays. At (13:26) Farley has an NCAA gambling tale that deters Joanna from future sports gambling. At (20:48) Joanna is giving up hoarding for 2018. 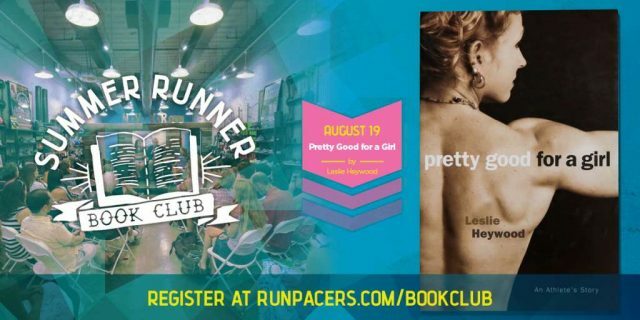 At (23:37) Heather Jeff joins us to help interview our guest Leslie Heywood, author of Pretty Good For a Girl, a memoir. Leslie talks about her experiences in and around running in high school and college. We start off at (26:00) with Leslie discussing why she decided to write the book in the late 90s about her experiences in the early 80s, and what it was like to be a female athlete in the early days of Title IX. At (28:48) she talks about the all out high mileage training philosophy that was common in the early 80s, and how her coaches emphasized weight and body image as part of the training program. At (34:25) we talk about some of the issues that forced Leslie away from the sport and the transition into power lifting. At (40:04) Leslie shares her story about an inappropriate relationship with a coach in high school and what helped pull her through the ordeal. At (43:28) we talk about the current “Me Too” movement and get a perspective on the issues from Leslie. At (47:37) Leslie talks about her current relationship with running. At (52:37) we talk a little bit about growing up with Title IX and then at (55:35) we discuss the current running scene and talk about what might be different. We are back from the interview at (1:03:00) and at (1:04:12) we talk about the viewing of Boston at the 14th Street Pacers store. At (1:09:52) we have a late-breaking accurate weather forecast and discuss the impending impact at the local grocery stores. At (1:12:38) we get a post-surgery update from Joanna. At (1:13:44) we talk about the ICE Dogs Marine Corps Marathon training team. At (1:16:21) we talk about last week’s show, including the technical issues at the beginning of the week and the unique guest promotion of the show. RunWashington Spring 2018 issue out!